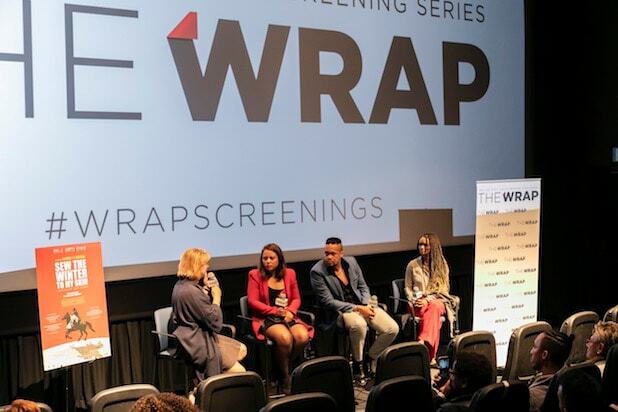 Following a screening of the 2018 film, South Africa’s Oscar foreign race entry, Qubeka participated in a Q&A moderated by TheWrap CEO and founder Sharon Waxman. Based on true events, “Sew Winter to My Skin” is a Western-style film that follows the violent and emotional last days leading up to South African outlaw John Kepe’s execution in June 1952. Kepe (Ezra Mabengeza), the self-proclaimed “Samson of Boschberg,” was hung for a string of crimes including theft and the murder of a farmworker. “If you ask me what the film’s about, it’s a love letter to our history. The pain that we live through in terms of apartheid made us who we are,” Qubeka told TheWrap at the Landmark Theatre in Los Angeles. He explained that his film, which features little to no dialogue, drew inspiration from filmmakers like Dziga Vertov and Jean-Jacques Annaud. He said he was inspired by the way such filmmakers relied on imagery to get their stories across the screen and decided to apply the filmmaking technique to compliment the psychology of his protagonist. In the multiple manhunt scenes before his apprehension, Kepe moves silently through cliffs and unforgivable terrain — all while carrying a live sheep on his back. Throughout the film he sneaks into houses and finds unique, if not stomach-churning, hiding places all for the sake of survival. Producer Layla Swart and actress Kandyse McClure, also at the Q&A, recounted their experiences shooting the film in a rural town in South Africa, where the story’s events really took place. McClure recalled hearing racist remarks from the local townspeople. She said the racist, pre-apartheid sentiments portrayed in “Sew Winter to My Skin” still remain in the South African town. Swart said the small town’s behavior is a result of the socio-political climate. However, she said that including the very real discrimination that’s intertwined with South Africa’s history was necessary for the film. Qubeka recalled going to school in a similar place in South Africa and his experiences with racism. Though it may be easy to point out bigotry, Qubeka said it’s necessary to understand and feel sorry for their bigots’ small points of view. 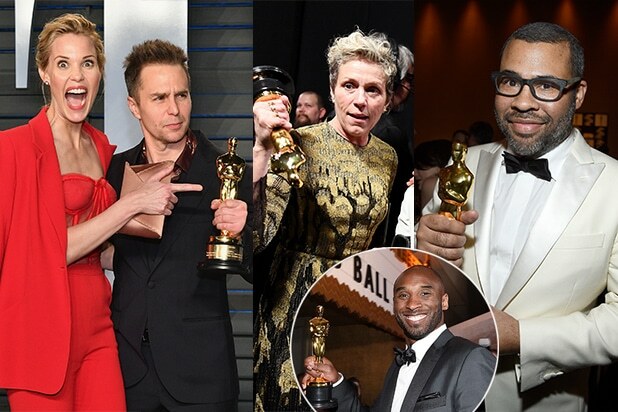 Sam Rockwell, Frances McDormand, Jordan Peele and Kobe Bryant walked away from the Dolby with Oscars, ready to hit the after party circuit. The Governors Ball, Elton John, and Vanity Fair events continued long after Jimmy Kimmel signed off for the night. A few floors above where "The Shape of Water" won Best Picture to cap off the ceremony, producer J. Miles Dale and double winner Guillermo del Toro coast in to the Governors Ball. "I did it all by myself." Best Supporting Actress winner Allison Janney's opening line of her acceptance speech was the early leader for "Quote of the Show." Tiffany Haddish, who had a breakout moment as a presenter, was fired up to see Frances McDormand at the Vanity Fair party in Beverly Hills. Also Read: Oscars: What Is an ‘Inclusion Rider,’ That Thing Frances McDormand Mentioned in Her Acceptance Speech? At the Governors Ball, Danny Glover (right) embraces L.A.'s only five-time NBA champion and Oscar winner, Kobe Bryant. Even Academy Award winners get photobombed. Gary Oldman gripped a new gold trophy as his wife Gisele Schmidt grew bunny ears at the Governors Ball. Winners headed to the Academy's official after-party to get their trophies engraved. Netflix's Chief Content Officer Ted Sarandos held the premium service's first feature film Oscar outside the Governors Ball, along with director Bryan Fogel (right), whose winning doc, "Icarus," detailed doping in Russian athletics. "Truth wins," the official @Netflix account tweeted. Over at the Elton John party, Rufus Wainwright, Lionel Richie, Miley Cyrus and Ricky Martin huddled up with the host. The 26th annual AIDS fundraiser netted $5.9 million for Sir Elton's foundation. This is probably the last awards show Darren Criss is going to be watching on television for a while. His portrayal of serial killer Andrew Cunanan on FX's "The Assassination of Gianni Versace" has him poised for an Emmy run this summer. Criss and Mia Swier (left) recently got engaged. Jamie Foxx headlined Byron Allen's second annual Oscar night viewing party benefiting The Children's Hospital Los Angeles. As soon as the Oscars telecast ended, Foxx took the stage and began performing Michael Jackson songs at the Regent Beverly Wilshire bash. Robert Lopez and Kristen Anderson-Lopez brought their daughter to the Governors Ball. The Best Song winners for "Remember Me" are the same married duo who won for "Frozen" anthem "Let It Go" in 2014. A one-time British soap opera star, Rachel Shenton is now an Oscar winner. Shenton and fiancé Chris Overton won for their live action short "The Silent Child." To the parties go the victors. The Governors Ball, Elton John and Vanity Fair were a sea of gold on Sunday night.